Mary House Catholic Worker offers free medically supportive housing to homeless, indigent adults with critical or terminal illnesses while performing Spiritual and Corporal Works of Mercy mandated by Jesus in Matthew 25 and the Beatitudes. 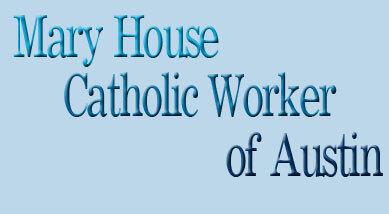 Mary House is part of the world-wide Catholic Worker movement started by Peter Maurin and Dorothy Day in 1933. To this date, there are approximately 200 Catholic Worker communities throughout the world. More than 1,000 men, women and children have lived at Mary House since it was founded in 1991 by Lynn Goodman-Strauss, who remains a permanent member of the community. Want to help out? The Help us page provides you with up to date information on ways you can assist in providing works of mercy to our guests in need. Mary House publishes a periodical newsletter called Jeremiah's Stutter. For the current edition and back issues, feel free to peruse the newsletter section of our web site. Photos within the website's banner above courtesy of Bob Kinney. All other content, unless otherwise noted, provided by TheoWorks Web Design. All content on this web site is the exclusive property of Mary House Catholic Worker of Austin, Inc. All rights reserved. 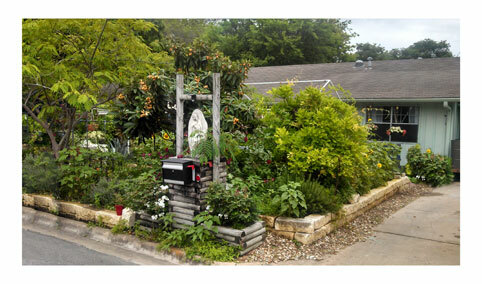 All rights to the name Mary House Catholic Worker of Austin, Inc. are reserved for the exclusive use of said incorporation. Index page, Mary House Catholic Worker of Austin, Inc., http://www.catholicworkeraustin.com.